This month’s stash give-away is really perfect for building your embroidery stash – and the perfect opportunity to try a variety of needlework fibers! 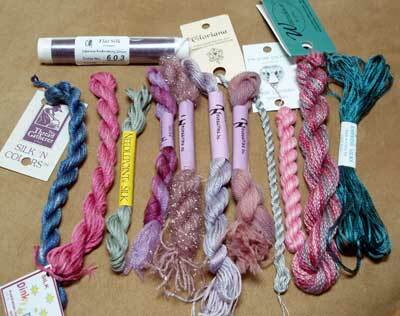 I’m giving away a dozen embroidery threads, each a different type. All twelve threads are full skeins, never used before. They’re new! And they’re fun! Half the give-away is comprised of silk. There’s Gloriana, Dinky-Dyes, Silk ‘n Colors from Thread Gatherer, Needlepoint Inc Silk, Empress Silk, and a whole spool of Japanese Silk from the Japanese Embroidery Center. The other half of the give-away is made up of synthetics, cotton, wool, and soy. There’s Needle Necessities Cotton, Overdyed Rachel, Charleston (the sparkly stuff), and wool, plus a skein of Soy Luster, and a skein of Caron Watercolors. 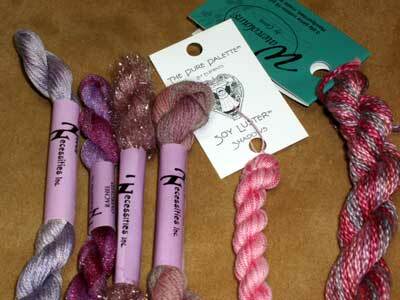 The hues in this half of the stash are pretty much purples and pinks. So, if you’re a fiber fanatic or a thread junkie, you might enjoy picking up 12 new skeins of a variety of threads, to dabble with! If you’re new to the whole needlework field, this is the perfect opportunity to give some different threads a try, for the fun of it. If you’re a crazy quilter – well! What couldn’t you do with these threads? And maybe there’s just one thread in there you’re dying to try – if that’s the case, go for it! You can always pass the rest on to someone else to play with! And, if nothing else, this would make a nice little package for you to share with another needlework friend – you can always make a little gift out of parts of it (or all of it!). 3. Make sure you sign your name to the comment! 4. Check back on Wednesday, February 25th, when I post the winner, which is drawn by random number. If it’s you, you’ll need to contact me with your address. The contest ends Wendesday, Feb. 25th, at 5:00 am CST. International readers are welcome to comment, too. I’ll ship the package via the least expensive air-mail option, should an international reader win it. Feel free to let your stitching friends know about the give-away, too! Therese de Dillmont’s “Encyclopedia of Needlework”. There are others in colour or more recent, there are others with more in depth subject matter on a specific style of needlework, but for the all encompassing, best classic practices book, this baby just keeps on chugging. Embroidery of Stitches By Mary Webb. It is mainly basic stitches, But I bought it to try and make a band sampler of my own, still need to get round to it! Currently, I only have one embroidery book: Doodle Stitching. I’m really just getting started so a stash of threads would help a lot! As a beginner, I’ve really appreciated your videos. Thanks! Ooooo Threads!!!! My fave book is “A-Z of Embroidery Stitches” or “The Embroiderer’s Handbook: The Essential Step-by-Step Guide to Creative Stitches and Versatile Techniques” since they are the same book just printed differently. The reason I love it is that it’s got easy clear step by step instructions that even I can follow! LOL And lots of variety as well as examples of the stitches used throughout the book! It’s a staple book and the one that I give and recommend to anyone beginner or those who just want to learn more. Without a doubt my favorite needlework book is Kaffee Fassett’s Glorious Needlepoint. I saw this book in a chain bookstore and when I opened it, it was like being struck by lighting! I had no idea such wonderful color combinations existed! And they were charted and I could reproduce them! It was the beginning of my real obsession with needlepoint, something that has brightened my light and challenged my mind for 20 years now. My favorite is by Sieglinde Schoen Smith: Mother Earth’s Quilt Sampler. I was so fortunate to see Sieglinde’s top-prize, award winning quilt at the Houston International Quilt Festival. She uses a ‘layered technique’ of embroidery, 1 thread, on the faces of the children and Mother Earth. I’ve seen this too on your blog–so nicer in appearance! My favorite embroidery book is Embroidery Techniques & Patterns by Marie-Noelle Bayard. I finally learned to make a French knot! Mmmmmm. Threads. Some of which I'm not familiar with, so I can see I'm going to have to do some research. To answer the question…I can't pick just one because I like both 'The Magic of Crazy Quilting' by J. Marsha Michler and 'The Crazy Quilt Handbook' by Judith Baker Montano. I refer to both of them over and over. There are also two new books in my collection I know I will be using a lot: 'Embroidery & Crazy Quilt Stitch Tool' by Judith Baker Montano and also 'Crazy Quilting – The Complete Guide' by J. Marsha Michler. As you can see, these are my favourite authors AND my favourite techniques! Elegant Stitches by Judith Baker Montano is one that Irefer to often along with a pamphlet called Embroidery Stitches that I found in my Grandmother’s sewing stuff they both describe basic stitches and a few extras. I especially like the maltese cross in the old pamphlet. What beautiful threads! I have a well worn copy of Therese de Dillmont’s “Encyclopedia of Needlework” that encompasses so much, I haven’t found a need yet to get another. One of my most inspiring books is Embroidered Garden Flowers by Diana Lampe. Oh I love threads and especially purple. I have a few books that I refer to all the time. One being Judith Baker Montano’s Crazy Quilting – The Complete Guide. Actually I pull out all of her books just to look at the pictures when I need inspiration. I also like the A to Z Embroidery books. If this shows up twice, forgive me. My browser went funky. I love the “Bible” books published by Krause Publications. I have the Quilter’s Stitch Bible and the Sewing Stitch and Textile Bible. The Embroidery Stitch Bible would be an excellent addition to my library. The threads would also make a great addition to my stash. I'm rather fond of Summit's "AU&NZ; Complete Book of Handicrafts". It's an old book from the 70s which covers a range of arts and crafts. It has nice simple diagrams for basic embroidery stitches (which I still refer to, when I'm not watching your video tutes) and I picked it up for $5 at an op-shop. Creative Embroidery by Jan Beaney and Jean Littlejohn – has lots of wonderful, inspiring photos and gives a lot of good info about designing. My favorite embroidery books are all of those in the A-Z Series of Embroidery books from Australia, including the embroidery, silk ribbon embroidery, goldwork, etc. Their instructions are so easy to follow and explicit, that they are the ones I turn to first. by Francoise Tellier-Loumagne. this book relates stitches to beautiful nature scenes. Very creative for those who want an embroidery book presented in a very different artsy way. I don’t have any firm faves with books, but I would love to own something by Trish Burr- thread painting, Di Van Niekerk- ribbon embroidery, and a squizz at Carole Samples Treasury of Crazy Quilting would not go amiss either. what a great stash. my favourite embroidery book is Just Stitch by Lesley Turpin Delport. (It is has just been republished under a different name). it doesnt have millions of stitches and techniques, but for inspiration for surface embroidery it is great. My other favourites are Embroidery and Nature by Jan Messant, and The Stitches of Creative Embroidery by Jacqueline Enthoven. Hard to choose a favorite because there are so many wonderful books. I would love to learn montmellick embroidery so the beginners guide to montmellick would be my pick. I just decided this morning that I want to make a crazy quilt with embroidered blocks and those threads would be great fun. Fingers crossed. Mine would have to be the Reader’s Digest Complete Guide to Needlework. Partially because it was a gift from my mother, who taught me everything I know about arts and crafts, but also for the clear diagrams and the breadth of subjects, including not just embroidery, but also knitting, crochet, and tatting. My favorite book of the moment is Bead Embroidery by Yukiko Ogura. It has wonderfully simple instructions and beautiful patterns. I love it! I love your give-aways! Thank you so much! My absolute fave book is Therese de Dillmont’s “Encyclopedia of Needlework. I actually just got this book as a christmas gift, and I just can’t put it down. I refer to it all the time, and it has great eye-candy in it. My all time favorite embroidery book is The New Anchor Book of Freestyle Embroidery Stitches. It is a great book for beginners like me.I got it from the Council Library. There are quite a few but I guess the Royal School of Needlework book is at the top of the list of my favorites. At this very moment – A-Z of Goldwork from Country Bumpkin. Maybe it sounds strange, but my favourite stitching books at this moment are books about Lithuanian weave. Simply I have never seen Lithuanian sampler before, so I created one in cross stitch, I am planing to make some other samplers using different stitches ant traditional ornaments. Hi, I don’t have an embroidery book, but after looking through your selection The Embroiderer’s Handbook seem’s to jump out at me. Thanks for the contest. Ouch, that is a difficult question to answer… you’re talking to embroidery addicts ! The book that get me hooked is the Treasury of Crazy Quilt Stitches by Caroll Samples, and I get back to it quite often, so I consider it is my favorite. Just one book. Impossible. If I'm doing canvas work then The Complete Needlepoint Course by Anna Pearson is the one I turn to. If I'm doing a sampler then The Proper Stitch by Darlene O'Steen. Hardanger then Janice Love's Basics and Beyond & Fundamentals made Fancy. Tassels then it has to be Tassel Making by Anna Crutchley. Then the Anchor Books on FreeStyle, Counted Thread, Canvaswork and Hardanger are good for just stitches. But if you are really going to limit me to just ONE book I think, today at least, I would chose The Embroidery Stitch Bible by Betty Barnden but then I really like Mary Thomas's Dictionary of Embroidery Stitch by Jan Eaton. So honestly I can't choose just one! The book I go back to again and again is ‘The Encyclopedia of Stitches’ edited by Karen Hemmingway. It is a great book with clear instructions, it’s also great for browsing through with a cup of coffee in a quiet moment. I have no embroidery books — yet. After reading your review, I’m definitely thinking about getting the Mary Thomas Dictionary of Embroidery Stitches. I went through your recommendations only now and have absolutely fallen for Embroidery Techniques and Patterns written by Marie-Noelle Bayard. Another one that beginners like me will find EXTREMELY useful is The Embroidery Stitch Bible. I would most definitely love to own both of them. For basics, the Readers Digest Complete Guide to Needlework saved my neck, so for now, it's my standby! Right next to the Mary Thomas's Dictionary of Embroidery Stitches, which is also awesome. For future acquisition? Hm…gee, I gotta CHOOSE? Hmmmmm….Did you know that 'encyclopedia of embroidery' gets you 279 results on Amazon?….AH! there it is! The threads look fantastic. Thank you! Never enough threads in the stash. I usually pull out Complete Book of Embroidery: Includes Crewelwork, Goldwork, Ribbon Embroidery, and Embellishments by Melinda Coss and Carole Samples Treasury of Crazy Quilt Stitches. I would love to have Judith Baker Montano books. Mary, what a lovely stash giveaway! Would love to have it to play with. And, yes, I’m a fiber junkie! The soy luster looks very interesting and the Japanese silk! Yum! My fave in books has to be the first one I ever bought. Erica Wilson’s Embroidery Book. It’s still a classic if you can find one out there in the used book market. I liked it so much I gave one to my mom for Christmas and another to a friend’s daughter who was learning to stitch. Anything to encourage needlework in a young person! I am just getting back into embroidery after many years of working full time and raising kids. I love it, but had to give it up. A book I would like to have is Mary Thomas’s Dictionary of Embroidery Stitches by Mary Thomas and Jan Eaton. What beautiful threads and so nice for you to gift them. My favorite book is a school notebook my Grandma Bennett had in high school in 1886. She wrote about and drew out her many sts. That’s my most prized item.Now I use it for my G-kids gifts. by Judith Montano – this is a book I’d love to have – it combines beautiful hand embroidery stitches with the art of patchwork. Love your newsletter and your contests. Great stash! My favourite embroidery book is not about embroidery as such; it is more to do with patchwork and redwork. It is “Living the Dream” by Leanne Beasley. Is is a very fresh and full of life book. I love it. Mine is perhaps a bit staid! It is the Reader’s Digest Complete Guide to Needlework! Somone gave me a copy thye had lying around. It’s in French which I can just about deal with because the diagrams are so good. I love it because it covers so many types of needlework and when you want to combine two, it’s brilliant to have one book to look techniques in. Also it somehow makes the idea of designing your own stuff much more accessible. So I need that variety of threads! Aimee Ray’s Doodle-Stitching. It’s so much fun and yet very good at instructing on basics. I love it!!! Iwould like to award you most dangerous/addictive website and newsletter! Since I happened upon it a few months ago I have ordered a kit from Jane Zimmerman, book on Goldwork from Amazon and The Embroiderers Handbook from my local book store. I tried to find the Readers Digest Completer Guide to Embroidery Stitches but it is apprarently out fo print. My favourite so far is Goldwork by Valerie Harding. Now if I could only find the time to say nothing of the money for the supplies. As a quilter, cross stitcher and hardanger addict – time is going to be the tough part! My favorite, because it was my first real refference book in embroidery, is Mary Thoas’s Dictionary of Embroidery Stitches. I actually got this book by accident. I learned my stitching by purchasing small kits and following the diagrams, so I thought I had no need for a stitch guide type book. I was going to return it….until I actually took a look through it! I admit that I’m a thread junkie. I know I’ll never have enough and right now I’m suffering from a craving to go to my favorite thread store to buy some more because I’ve been doing quite a bit of embroidery on a band sampler but I know I have to take more money than I have to spare at the moment. These are beautiful threads and there are several that I have never tried. Since I started embroidering again by doing crazy quilting, I have many more CQ books than embroidery books. I love to find books that have stitches that I haven’t tried yet. The one I use most now is The Embroidery Stitch Bible, by Betty Barnden, but I would love to have some of the A-Z series to add to my library. I also use the notes from my classes with Sharon B. quite a bit, too. I love bouillion embroidery and purchased an inspirations magazine about fifteen years and proceeded to make a ring cushion which had buillion rose buds on it which won me a silver prize in the local arts and crafts festival. I would really love the Country Bumpkin book A – Z of Bouillions. Bouillion designs are a lovely way to embroidery baby blankets with toys, insects or other creatures. My favorite book is so old that the price might shock some. $2.95, softcover, 1970. Creative Stitchery by Dona Z. Meilach and Lee Erlin Snow. Most of the photos are in black and white which allows the viewer to interpret how a piece might look. My favorite right now is the Embroidery and Crazy Quilt Stitch Tool by Judith Baker Montano. It is spiral bound and sits up on the arm of my couch perfectly! It also has right and left handed stitches. I enjoy your blog, it has given me a lot of inspiration! I have two books that I use all the time, An Encyclopedia of Ribbon Embroidery Flowers by Deanna Hall West, a wonderful book with instructions that are so easy to follow; and An Encyclopedia of Crazy Quilt Stitches by Linda Causee, which gives great instructions on the basic stitches for crazy quilting. They are both from the American School of Needlework. I am a bookaholic so I have many more, but these got me started and I still refer to them often. Whaat a wonderful array of threads. Last March when I discovered CQ I had DMC 6 strand floss only! 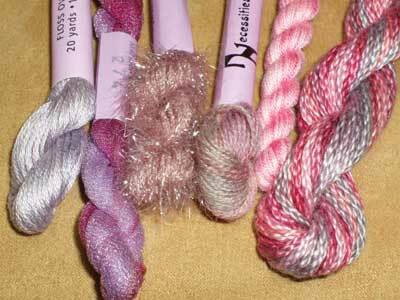 Since then I have discovered Perle, silk, rayon, fancy fibres and many more. I would love to experiment with more. The Threads & Crafts book of Ribbon Embroidery and Stumpwork. 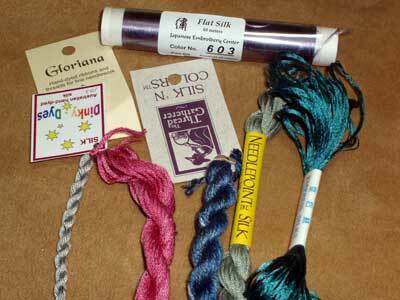 I have been colleting laces and fabrics for a crazy quilt. I would love to try all kinds of embroidery on it. I love all kinds of hand needle work. My favorite is The Embroiderer’s Handbook by Country Bumpkin…I have almost all of their A to Z books which I just love. They have extremely good pictures of stitches. This is my FIRST give away that i am entering!!!!!!!!! My favorite embroidery book is Embroidery by Ksynia Marko. this book is very OLD (pages yellow) but the samples are very clear. My favorite books are The Embroiderer’s Handbook by Margie Bauer and Elegant Stitches by Judith Montano. I don’t have any embroidery books right now. I’d love to have a encyclopedia of stiches of some kinds with great detail/pics of how to replicate the stitches. It’s hard to find them around here (and I like to put my hands on them) so I haven’t bought any online. If you have suggestions – I’d love to hear them. Three that I’m looking at so far are – The New Anchor Book of Freestyle Embroidery Stitches, The Embroidery Stitch Bible (Spiral-bound) by Betty, or Mary Thomas’s Dictionary of Embroidery Stitches. Hi my first give entry. my favorite book is embroidery by Ksynia Marko This book is very old (pages yellow)but is very helpful to me. My favorite book?? Just one??? it has everything from how to handle different threads, storage, fabrics, tons of stitches, illustrated at each step, and finishing info for various types of project types. My favorite book is Mary Thomas Dictionary of Embroidery Stitches. It has many pages marked for special stitches I love. the Embroidery Academy in Williamsburg, Va. I had the pleasure of assisting a lovely lady, Jan Vaine. She does the most wonderful embroidery and stumpwork on Baltimore album quilts. I had never even heard of stumpwork before this. The thought of putting wonderful insects and bugs on the quilts with 3-d wings was amazing to me. The book I would love to have is Ribbon Embroidery and Stumpwork by Di van Niekerk. I’m very new to embroidery – just started classes. I’ve been using Mary Thomes’s Dictionary of embroidery stitches. My all time favorite book is Stumpwork Embroidery by Jane Nicholas. I love all of her books but I think this one is the best. As for now i dont have any embriodery book.what ever stiches i have learnt is through my aunt or net.i would like to have Embroidery Stitch Bible by Betty Barnden which cover around 200 stiches. thanks to your reveiw of the book. soy thread? that sounds very interesting!!! I love fabric, I love fibers, I love using my hands! what a great blog candy1!! hmmm, fav embroidery book? The magic of Crazy quilting by J. Marsha Michler. LOVE all the samples in that book! it’s on my night stand for eveing reading…. THANK YOU SO MUCH FOR THE VIEDO TUTORIAL.. Your site was the first that I looked into when I searched for embroidery online. And I am happy that I did. It has given me the inspiration to make my own blog. It is really nice bbok with Illustrated stitiches and also projects that one can do.. I liked it..hope others do to..
What an exciting group of threads! My all time favorite embroidery book is “Samplers and Stitches” by Mrs. Archibald Christie. My mother gave me this treasure while I was in college studying textiles, 35 years ago.Mrs. Archibald Christie, also known as “Grace” compiled this collection of what she called” the past beauties of the delicate art of embroidery,” in 1920.She wanted young embroiders to take these stitches and create modern embroidery and design. "Royal School of Needlework – Embroidery Techniques"
I have many polish embrodery books & magazins. When I look et your list of books, I think I want to have "Variety Magazines: Italian Cut Work and Filet Lace". I don’t have a favorite embroidery book. All of the embroidery books I have are my favorite. But I do have one that is high on my list, and Long and Short Stitch Embroidery, by Trish Burr, is that book. I’m fasinated by this stitching technique and especially the results. The book has diagrams for color placement and stitch direction,and stitch explanations for the beginner to the advanced stitcher. If you don’t have this book, get one for your library, not only is it a great refernce book, but it is also a great book for inspiration. My embroidery book no. 1 is Textildesign Sticken. (Textile Design Embroidery)by Francoise Tellier-Loumagne. This is not a book of stitches but it is pure inspiration for transferring nature patterns into embroidery. A wunderful book. This post is on my Birthday! I have too many favorite books. Encyclopedia of Needlework and The Proper Stitch are my favorites for go to help. Also the A to Z books and am looking at Hungarian books on embroidery and Halas needle lace! Thanks for the chance! My current favorite embroidery book is Embroidery and Crazy Quilt Stitch Tool by Judith Baker Montano because……it give directions and illustrations for south-paws. Unfair question, Mary. ALL my embroidery books are my favorites! That’s why I collect them! Right now, though I guess I’d have to say my copies of the facsimile’s of Weldon’s Practical Needlework along with Weldon’s Encyclopedia of Needlework. My favourite embroidery book is “Mary Thomas’s Dictionary of Embroidery Stitches”. It’s really taught me a lot and the pictures are really clear and beautiful. It renewed my interest in Bargello too. Those threads look absolutely beautiful. What a gorgeous giveaway. Thanks Mary for a great question because your readers have given me more ideas of good books on the topic. What gorgeous thread! I never get to see threads like those in my area. I’m teaching my grandaughter to embroider and we love your website and those emails we get from you everyday. We have no books, but have visited the book reviews this afternoon and we are going to purchase the Bmbroidery Handbook and the book on White Work. Thanks for all you do. My favourite needle work book is the complete guide to needle work published by Reader’s Digest. It gives a complete illustration of the embroidery stitches and also few projects which we can do. I learnt most of my embroidery techniques from that book. Also I love to collect embroidery books it does not matter which one. I think all the books has one or the other important thing which we can learn. Each book is a treasure in itself. I currently don’t have an embroidery book around, but my favourites have been (and still are) all books about Danish Crosstitching with Danish Blomstergarn. I just love the colours of their threads (though they are expensive). Most of all, their patterns of plants are very true to nature. My favorite embroidery book would be the A-Z Book of Embroidery Stitches by Country Bumpkin. Great give-away! Mary-what a gorgeous giveaway! Needless to say…I hope I win!! That said and out of the way, my current favorite is Woman’s Day Book of American Needlework by historian Rose Wilder Lane who writes like a novelist about the past world of women stitchers. I’m very new with embroidery and crazy quilting, so everything I’ve learned is online…………I would love to have the A_Z embroidery but I would like anything that teaches..oh the threads,,,,,,i use embroidery thread dmc,,,,,,,,i had no idea there was so many kinds……….i really need to go shopping. Thanks for your comments and for participating in this month’s give-away! Laura Bullinger – nope, didn’t get the comment, that I know of. I don’t normally reject comments, unless they’re obviously spam or contain something un-publishable! Please do post again – I’m curious about Rose Wilder! Ethnic Embroidery by Margaret Ohms is pretty great. I just borrowed it from the library and am seriously coveting it. But it’s out of print, so thank goodness for liubraries. Oh! the creative juices start just by looking at the beautiful threads. My favourite book of the moment has just this hour arrived in my letter box from my daughter, for my birthday. It is “Beginner’s Guide to Goldwork” by Ruth Chamberlin. The threads look wonderful! Would love to try them – my only home-town sourse is DMC. I’m mainly interested in Redword, so don’t vary my stitches much, but when I do, I normally go to your website to look up a stitch. This is the most fun website! My favorite is The Embroiderer’s Handbook by Margie Bauer. While looking at it in a bookstore, I saw page 37 “Cast-on Stitch Rose,” and I knew I had to buy the book. It is informative, clear, and full of good ideas. I have no favorite, as I am a beginner. I would like to own The Embroiderer’s Handbook. Your blog has increased my interest in embroidery, which has always been there, but in simplistic terms. You demonstrate how the art of embroidery can be taken so much further than what is offered in craft stores, and provide resources for obtaining quality products. Thank you for the time you put in this blog. My favorite embroidery book is “A-Z of Embroidery Stitches” because I always need to know something. I don’t usually try for the “stash give away” but this collection made my eyes water! My favorite embroidery book is “Crewel Embroidery Old and New” by Weldon’s Needlecraft Editors. It’s not that great a book – I don’t suggest everyone go searching through book stores to find it. It is just the first embroidery book I got. It belonged to my step-mother’s mother and she gave it to me when I took up the craft in high school. I does have fairly good drawings of many stitches and I do still refer to it, occasionally. I do love the way it smells – that old book musty smell. But I do think it is an example of beauty being in the eye of the beholder. I have several needlework books, both for instruction and inspiration. My first book was Kooler’s Encyclopedia of Needlework and I still find it a quick, well illustrated reference. For depth, variety and stimulation, Therese Dillmont’s book is excellent. I also find the online books that you have linked to on occasion, to be great sources of inspiration. I dont yet have much collection of books, but have few Ondori books of patterns. I would love to have The Embroidery Stitch Bible by Betty Barnden. It surely looks good in your reviews. I don’t have any embroidery books at present. I would really like to have Dictionary of Embroidery Stitches by Mary Thomas, The Embroider’s Handbook by Margie Bauer and Crewel and Surface Embroidery by Trish Burr.As I’m a beginner I refer to your video tutorial for stitch instructions.I’m addicted to your blog.Thank you for this lovely blog. Ah. Picking a favorite embroidery book is like selecting a favorite child — or flavor of ice cream. It all depends on the day and my mood. But day in, day out, I find that I rely on the A-Z books, especially Embroidery Stitches. They are a wonderful resource. Wow! fantastic giveaway, so many beautiful threads! It is hard to chose just 1 book! I have some of the A-Z books and would love to have all the others! I love the CQ books by JB Montano, C. Samples and M. Michler too. For Hardanger I adore J. Love. For needlepoint I could not live without Father B’s Big Book. Anchor puts out a nice little set of inspirational books on various techniques and I have many of them. Why do I have to choose just one? Thanks for your work on this blog. It is also very educational and inspirational. I would love it if you drew my name for all the lovely items you have chosen this month. My favorite is a little pamphlet put out by Coats & Clarks called "100 Embroidery Stitches." They put out a new version of it every 10 years or so but it's pretty much the same contents everytime! I bought this in Oxford, England when I was over there last summer at the Royal School of Needlework. I always turn to it when I’ve got a stitching block or am at a loss for design or texture. The pictures are fabulous and never fail to make my fingers itch to stitch again! Lovely stash you’ve got there! Let’s see, favorite embroidery book…well, after a little thought I’d have to say I’ve used Judith Baker Montano’s Elegant Stitches the most, although I have a couple others too. This book is spiral bound, full of great photos and has nice stitch instruction. I recently got the Embroidery Stitch Bible, and one similar on beading, that I’m just beginning to peruse at length. I just ordered the A-Z of Bullions and it’s in the mail to me! Bullion is one of my favorite stitches and I’m looking forward to learning how to do more with it. As for the next book on my list, well, it’s not really a book. It’s Carole Samples’ set of stencils! I’ve been looking everywhere for stencils and can’t find what I’m looking for, just simple designs and shapes. And her new batch of stencils has yet to be put together as her machine is kaput, so I’m still waiting. But those stencils are next on my list! I enjoyed reading about everyone’s faves. I’m loving Trish Burr at the moment, I’ve gotten really into silk shading. But then ‘The Art of Embroidery: Inspirational Stitches, Textures and Surfaces’ byFranÃ§oise Tellier-Loumagne is also really good – some amazing textures in there..
Love your site and daily reports! My favorite embroidery book is my copy of Heritage Embroidery, 1st ed. 1967 by Elsa S. Williams. As a Newbie to Crazy Quilting and Embroidery I have many favorites and own most of them..but, I think the one that I enjoy and find myself searching for that perfect thing to embroider is, Motifs for Crazy Quilting by J.Marsha Michler. I have all of her books and this book has techniques , ideas, motifs, it seems to cover it all. My all time favorite embroidery book is Motifs for Crazy Quilting by J. Marsha Michler. It has tons of designs to be embroidered, shows close-ups of fun embroidery and some stitching lessons. The photography of finished embroidered blocks is wonderful–very inspirational! I wold love to win this…My favorite book would have to be The Complete Encyclopedia of Stitchery by Mildred Graves Ryan…Thanks so much! I guess I’m whistling the wind, but I have to try. Please enter me in your drawing, I love pretty things. I think Encyclopedia of Needlework by Therese Dillmont, since I got it on line and it didn’t cost me anything. I’m an absolute beginner, and have only 2 books – Doodle Stitching, and a late 19th century ‘encyclopedia’ of needlework. Though I don’t own it, I have had the Di Van Niekerk Ribbon Embroidery book checked out of the library so many times, it feels as though it is mine and I lend to the the library! I love that book and only wish my work looked as lovely! Whether it is sewing, quilting, or embroidery, I love doing things “the old fashioned way” , so I love Therese Dillmont’s books. I also love anything Wendy Shoen does. THanks for your site, it keeps me motivated. My favorite embroidery book would be Mary Webb’s Embroidery Stitches because it is clear and easy to follow. However the web is also a great source of how to as well so it is a bit of a toss up. My favorite is Simple Stitch Life. It’s a Japanese book that (lucky for me) my friend bought for me! I can;t read Japanese though .. but then again, pictures speak a thousand words! First I would love to win those threads!! I am fairly new to CQing and have experimented with some threads, but nothing like the ones you are giving away. My favorite book so far is And Encyclopedia of Crazy Quilt Stitches and Motifs by American School of Needlework. I think the next book I buy will be the Encyclopedia of Stumpwork. Embroidery of Stitches By Mary Webb, or any that I could use to learn how to hand stitch a crazy quilt. Would like to someday incorporate some of my tatting on a quilt also. To tell you the truth, I love all my books that I use for my crazy quilting. I just got a new one, so I’m paying a little bit more attention to it right now and liking it. That book is Three Dimensional Embroidery Stitches, by Pat Trott. I still have some printed baby animal blocks that I embroidered when I was very young. As an adult, I became fascinated with wool crewel work until cataracts stopped me for a while. There are several unfinished kits around that catch my attention away from my current addiction to appliqué. Several years ago I stumbled onto the book, “Ribbon Embroidery and Stumpwork” by De van Niekerk, which I treasure. I have not found the courage to attempt this project, but still love to wander through its pages just to feel the inspiration from the beauty created therein. Since discovering your website and newsletter only a few weeks ago, I feel another addiction coming on. Thank you for the instruction and inspiration. My goodness, I’m glad I saw this before it was too late!! I can think of SO many things to do with that lovely bunch of thread! Embroidery book? Don’t have one, but would love to see one doing not-so-usual things with thread of all kinds. My current favourite (of a very small collection) is 18th Century Embroidery Techniques by Gail Marsh. I have just adapted one of the designs for a reticule for a friend. There was much squee! my favorite book would be a 4H book that I received in late 60’s. I first book of embroidery I have. It simple and just beginning stitches in it for young people to try. 2nd favorite would be Reader’s Digest Complete Guide to Needlework a gift from my mom. The Complete Stitch Encyclopedia by Jan Eation. I went out of my way to find this book years ago (not before computers but before it was SO easy to find books on the computer). I love the close-ups and the color and the written text. It ws part of Barron’s Educational Series. I love it! Thanks for the giveaway. I’m trying to find time to embroider more. My favorite is not actually a book, but rather a magazine–McCall’s Alphabets to Embroider..pub. in 1976. Poor little thing, it’s been through a flood and all these years.I don’t think the pages will transfer any longer, but I love the designs. I would have to say that mine would be the Reader’s Digest Complete Guide to Needlework. I got it from a thrift store a few years ago and I love it because it was one of the first needle books I’ve owned. My favorite’s are the A to Z of Embroidery Stitches 1 and 2. I love Country Bumpkin Books and the Insperations magazine. Creative Sampler Embroidery – Caroline Vincent. She embelishes plain counted cross-stitch in some extremely creative ways to make lovely pieces. Very inspirational! Gorgeous threads — someone is going to be very fortunate! I have subscribed to the Country Bumbpkin Inspirations and Smocking magazines for a few years. They are beautiful, informative and I always find something I want to try right away! I just tore my house apart trying to find my copy of Dorothy Bond’s Crazy Quilt Stitches. (put some place safe so I could find it…jeesh!!) Also have Readers Digest complete guide to embroidery stitches from the library right now – looks like a good one to own! Purple, how can I resist? Can’t pick a favourite I love them all and want so many more. I asked myself “if I could only keep one book, which would it be?”. Answer: The Techniques of Japanese Embroidery by Shuji Tamura. I use it nearly every day and can’t bear the thought of being without it. That’s a hard decision to make as I have several that I use frequently. I hope I was allowed to list all three – 1 – A-z by Inspirations magazine, mines now getting ratty at the edges, quilter and patchworkers stitch bible (new one I found recently) and Tracey Franklins latest gold work book. Mary your giveaway is beautiful as ever! My favourite embroidery book is Trish Burr’s: Crewel and Surface Embroidery: Inspirational Floral Designs. I flip through this book almost nightly and see new details that I never noticed before. The way she explains the technique makes it sound so simple – she takes the mystery out of thread painting. Currently my favorite book is Trish Burr’s Long and Short Stitch. It is my bible as I stitch a clergy stole as a gift. Mary, thank you for all your wonderful tips and insights. You are an inspiration and a blessing. I just got a new embroidery book, and I can’t wait to try the projects. It’s called Kyuuto! Woolly Embroidery (Japanese Crafts). I don’t have a favorite embroidery book but I would love to have a Japanese book called DESIGN COLLECTION FOR KIDS 365. Thanks for the giveaway! Fun stash! Thanks. For needlepoint it has to be The Needlepoint Book by Jo Ippolito Christensen. So thorough and so well put together I read it for fun. For practice and learning new stitches (and for fun) Marion Nichols Encyclopedia of Embroidery Stitches including Crewel. For general embroidery I guess (it’s hard to choose) Mary Thomas’s Dictoionary of Embroidery Stitches. After reading so many comments, am looking forward to getting my hands on a copy of Encyclopedia of Needlework by Therese de Dillmont. Thanks again. Maureen M. D.
I don’t have an embroidery book but I would like one such as “A-Z of Embroidery Stitches”. I particularly enjoy Marion Nichols’ “Encyclopedia of Embroidery Stitches, Including Crewel.” Being fairly new to embroidery, I like experimenting with new stitches. If I can’t figure out how to do the stitch from the illustration and explanation, I can always head over to Mary’s Video Library of Stitches–my all time favorite embroidery resource! The Complete Encyclopedia of Stitchery by Mildred Graves Ryan – similar content to Therese deDillmont(have that too)but includes very clear line diagrams of stitches. Also, Embroider Now by Hetsie van Wyk – a great book on different embroidery techniques, clear stitch illustrations etc. and project directions. Thse two were my first embroidery books and I still refer to them over 25 years later. Always the latest addition to my library! One I love as a source of inspiration is ‘Reflections Of Nature, The Art and Embroidery of Jane E.Hall’ published by Search Press. Exquisite work, lots of photos, some instructions – I just marvel at the detail and realism of her embroidery. Please enter me in your giveaway. I like Therese Dillmont’s embroidery book (I got it free on-line). I’m just returning to embroidery after a long hiatus. I used to do lots of counted cross-stitch but I now am trying different types and need to add a greater variety to my stitch repertoire. To that end, I’m planning to “stitch” through “The Embroiderer’s Handbook” by Margie Bauer. And because I have a new fixation on monograms, my wish list includes, “Compendium Of Ancien Artistic Initials For Vintage Style Monograms” by JF Shepard. I’ve never used any of these threads so this would be a real treat. Thank you so much for the offer. Absolutely beautiful stash. My favorite and best reference book that I own is Erica Wilson – Crewel Embroidery. I have consistently used it throughout my different embroidery projects, either to learn a new stitch or to refresh the ole memory. Since I am now older than the book itself, I have to say I really got my money’s worth! I’ve just been given Mary Thomas’s Dictionary of Embroidery Stitches’,loads to get into there! I have two favorite books. First, though not a true embroidery book, “The Mary Frances Sewing Book” by Jane Eayre Fryer. The book is really a treasure in itself! Second would be my old Reader’s Digest Complete Guide to Needlework. Simple, concise, complete. I love your choice of colors this month, simply beautiful! Being new to embroidery the stitch bible looks like it would come in very handy. But I would love to learn how to needle paint, all your wonderful work and the ideas on this site make it next to impossible to decide what to tackle next. My favorite book is a new one that I just purchased called the A-Z of Goldwork with Silk Embroidery. Why, you ask, its because of the wonder illustrations which personally I find to be really helpful. I am new to the goldwork technique and find this book to be a great tool to have. This looks absolutely lovely! Functional as well as a beautiful piece of furniture. May I dare ask the price? I’d love to win these. I do needlepoint and would love to try new fibers. These are beautiful! My favorite embroidery book is the Stumpwork, Goldwork and Surface Embroidery Beetle Collection by Jane Nicholas.